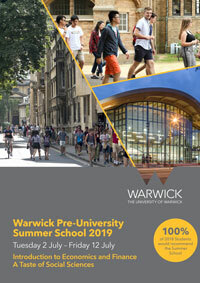 If you are an enthusiastic and motivated 16-18 year old student wishing to have an unforgettable and inspirational summer experience, our Warwick Pre-University Summer School is for you. A fully catered programme with no hidden costs. My time at Warwick Pre-University Summer School was an experience I will never forget. Being always coordinated by truly amazing ambassadors and University staff made this event very enjoyable and useful in order to have a clear perspective for my future plans and university life, which was one of my main aims when I had applied for the Summer School. The multicultural community that I met at Warwick helped me feel like home and motivated me to make long-term friendships with teenagers who share the same passions as I do. Overall, the Summer School had all I wanted: high-quality academic content and facilities, friendly people to talk to after the course ended and orientation programmes for prospective Warwick students. Don’t miss the opportunity to apply for the 2019 edition! To be a part of Warwick’s inaugural summer program for Pre-University Students was an opportunity I simply could not have missed. To start with, being around students from very different backgrounds who had the same academic interests as mine was a great feeling, especially because it gave me the chance to be part of discussions where I learnt to look at things from different perspectives. Also, Having such enthusiastic professors teach us made concepts of game theory, along with group activities, enjoyable! Furthermore, special lectures on subjects such as Democracy made me enjoy topics I didn’t realize I was interested in. Time spent outside class was just as fun, thanks to the Student Ambassadors who were there for us throughout the 10 day program. To summarize it all, this course was exciting from start to finish! From the welcome barbecue at Warwick’s beautiful campus to graduating at the Shard in London, it felt extremely well put together and I couldn’t have asked for a better experience. I can only say that this is the perfect culmination of a well cultured university experience which introduces you to new people and is most importantly, fun. It's been a while since the program, but the memories are still fresh in my mind! I was on the Economics and Finance program, and looking back, it was a very good way to start my summer. In short two weeks I had an opportunity to visit one of the finest university in UK and its London campus, meet amazing staffs and students to share and develop our interests. I also loved small bits like the visit to the Turing Institute, different trips and of course the world cup atmosphere which certainly added something to the entire program! I really enjoyed the program from the beginning till the end, and I'd like to thank all the people who made this possible. The pre-university summer school was a great experience altogether! I learnt a lot and would definitely recommend it, it gave me an holistic view of the life a student lives in a university and if I get a chance I’d love to come back!